Handsomepants and I are so excited for some friends who recently had some big changes in their lives. They bought a house, which in the Denver market is a feat in itself; and more importantly they had their first baby, a little boy, and the delivery was apparently went "freaking awesome!" I haven't had a chance to meet the little guy because I've been unable to shake a nasty stomach flu and the last thing new parents with a 2 week old need is a stomach flu! But i did manage to make this little baby quilt finished on time for MR. D's baby shower (I missed it because of this stupid stomach flu), so I know he'll be nice and warm in this crazy Colorado weather. Some other materials you'll need include a fabric choice for the letter in the center block, and paper of some kind to create a template for your letter. I used freezer paper so that I could avoid using pins to secure the paper to the fabric. If you like to use fusible webbing for applique, grab some of that and ignore the applique instructions in Step 1. Start by making the center square with the letter on it. Trace and secure your paper template to the fabric and cut the fabric 1/4" away from the paper. My letter was 5.5 x 4.4" I originally wanted the "D" to be 4.5" wide, but I free-handed the curve of the "D" and being off by 1/8" was close enough for me. Iron under the 1/4" allowance so that the letter has a smooth edge the won't unravel. Snip the 1/4" allowance into small sections around corners and rounded edges if you need to. 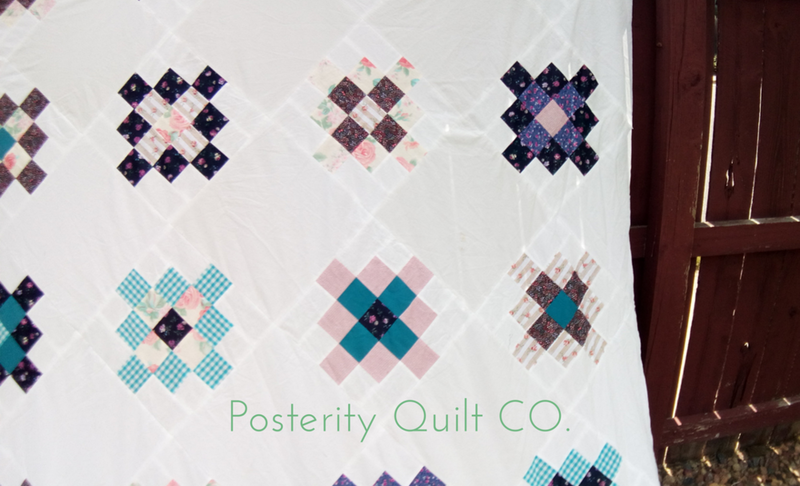 When your letter is finished, center the letter on the 7" square that is going to be the center of your quilt top. You can do this by subtracting the height of your letter from the height of the fabric square, and divide the difference by two. That result is how much space you'll place your letter away from the top and bottom edges. Repeat that math formula for the left and right sides. To clarify, my letter is 5.5 x 4.4". To determine the distance from the top and bottom of the 7" square I should place the letter I follow this equation: 7 - 5.5 = 1.5 then I divide 1.5 / 2 = .75. That means that my letter should line up 3/4" from the tops and bottoms of the 7" square. To determine the distance from the left and right sides of the &" square I should place the letter, I follow the same steps according to the width of the letter. 7 - 4.4 = 2.6, divided 2.6 / 2 = 1.3. As you can see in the picture above, I used two ruler to help me center my letter. The top black ruler is set 3/4" of an inch from the top, and the side yellow ruler is set 1.3" from the edge of the square. Pin your letter in place. Sew on the letter to the 7" square. I lengthened my strait stitch as long as possible and eyeballed the needle placement. Try to keep the needle placement as close to the edge of the letter as possible, that will keep the letter's 1/4" allowance from slipping out and unraveling. If you choose to use a decorative stitch to applique the letter on, I would suggest a few basting stitches to keep the letter from sliding around. I would also suggest removing the paper template before you start the decorative stitches or else you'll spend the next couple of hours digging out tiny pieces of paper from underneath the stitches. I learned my lesson when I last minute decided to use a zig-zag stitch instead of a strait stitch. I didn't catch my mistake until I finished the inside of the "D."
Piece together the 7" squares and 3.5 x 7" rectangles so that there are 3 squares and 2 rectangles to form three rows. Attach the rows with the 3.5 x 28" strips. Then piece the 7 x 28" and 7 x 43" strips and square up the corners. Press seams open. I will admit that I regret how the stitches look in the quilting. I don't know if the tension was off slightly or what, but I just don't like that it looks like the needle stabbed the fabric to death. At first I didn't realize how stippled the the stitches look, but the more I look at these pictures, I'm rather frustrated with how they turned out. This is one of my favorite fabrics. I don't usually gravitate towards batiks, but this one reminds me of fireflies in the summer and I love it! Because I'm a classic procrastinator, I didn't have much time for much fancy quilting, so I did a simple stitch in the ditch around the 7" blocks and then 1" away from the blocks. Simple and basic, but it helps reiterate the grid pattern of the quilt. I also have a little mishap once finished. Little Man got a hold of an orange highlighter and I was able to stop him from scribbling all over the quilt, but he did manage to do some damage. I washed the quilt and thankfully had no problem getting out the stain! Vanity shot: check out that stitch in the ditch! I can't wait to not be sick anymore so that I can go visit little Mr. D for the first time! I would say that making baby quilts gives me baby fever, but I only have another 10 weeks before another of my own little peanuts pope out! What a great excuse to go fabric shopping! This is just a mock up I made of the "Sprinkles on Top" block. 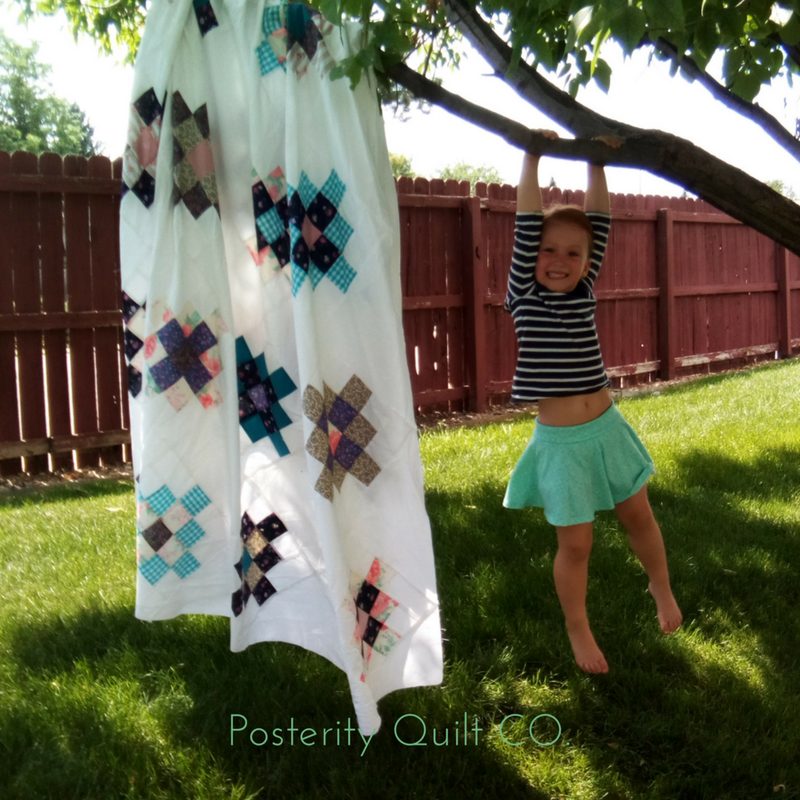 I have an actual quilt top in the making, but I was so excited about the block I wrote this post without finishing it first. Earlier this year I took part in the New Quilt Bloggers Blog Hop hosted by Yvonne, Leanne, and Beth. It was an awesome experience and a great to discover and be discovered by other new bloggers. Earlier this month I received an email from Yvonne that she had sent around to those who took place in the NQB Blog Hop, that announced a rebranding of Quilt-Pro Systems, a quilt designing software developer. The company was looking for about 100 block designers for a collaborative project called Block Party. I thought this was an awesome opportunity to make connection in the quilting world. I had zero experience designing blocks, but I gave it a shot. And I missed. My submission wasn't selected for publication, but I had a lot of fun anyway. And for you, my lovely readers, that means you get a free block design! These are all of the pieces needed to create the Sprinkles on Top block laid out in their proper locations. * Remember to use a 1/4" seam allowance. On all of the red, teal and 3" white squares mark a line from corner to corner. These are going to guide your stitches when you piece these square onto the larger white squares. Place one teal square right-side down on one white square and piece together along the marked line made in Step One. Cut excess fabric off from the corner side of the stitches, leaving a 1/4" seam allowance. Press seams open. Place a red square right-side down onto of the teal corner you created in Step 2 and piece together along the marked line made in Step One. This is what your finished square should look like. If you need to, use a ruler and square up to measure 4 1/2" x 4 1/2". I don't think you should need to square up, but as you can see from the picture, not all blocks turnout perfect. Repeat this process to make 4 squares. 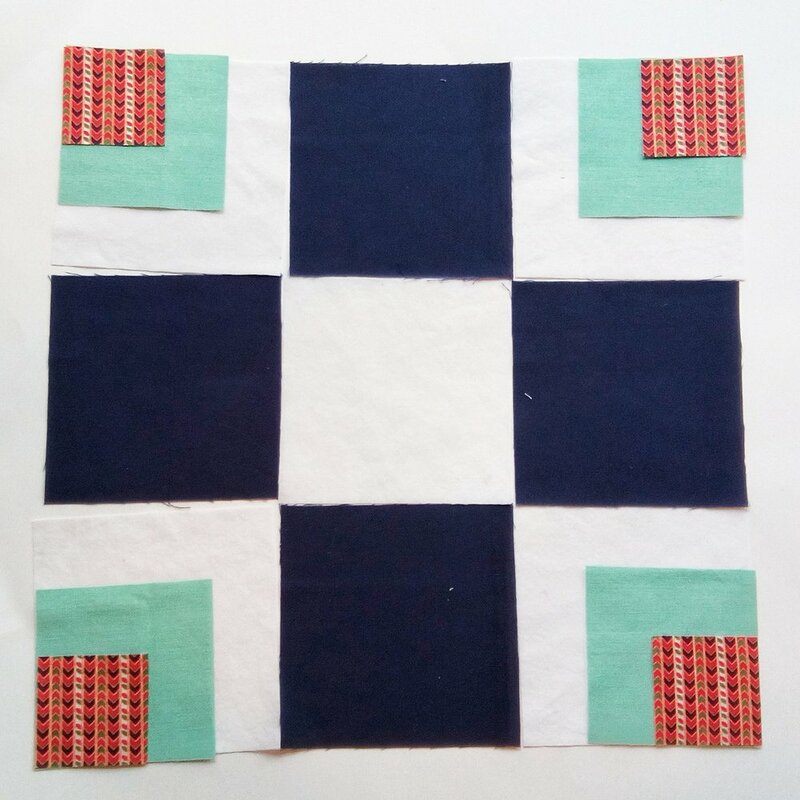 Place a 3" white square in a dark blue square and piece together along the marked line made in Step One. Repeat this process on the opposite corner of the dark blue square so that you have a square like the one in the picture. Lay out all of your squares and piece them together. Press seams open and square up your block if necessary. Your finished block should measure 12 1/2 x 12 1/2" when finished. If you couldn't tell, it's play off of a Friendship Star, nothing too fancy, but I've lately been into quilts that show off negative space and I tried to keep that in mind when I thought of this block. What do you guys think of the "Sprinkles on Top" block? Try it out for yourself, I'd love to see your versions! At the beginning of the year, I had made a series of New Year's resolutions that were selected in order to increase my skills in quilting. All of my life I had been mediocre at everything I tried, a jack of all trades, master of none. But quilting has been the only hobby I actually stuck to longer than a year, and it's something I plan to master. 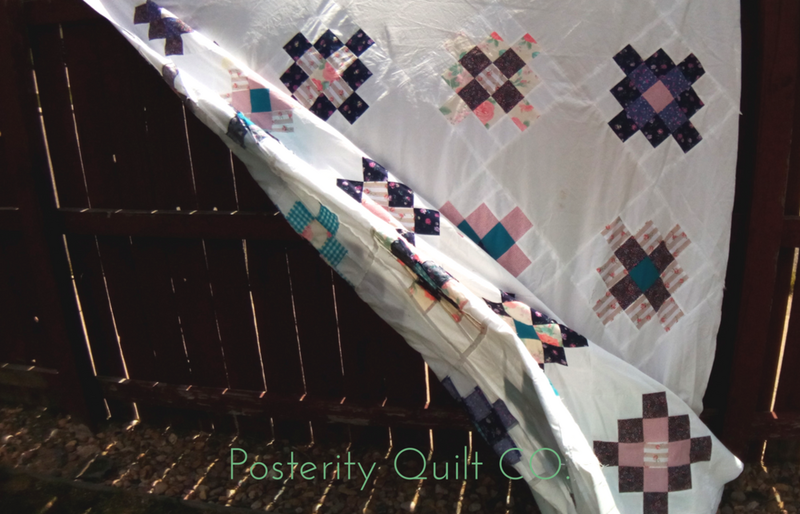 One of the ways in which I wanted to stretch my abilities was to write my own quilt pattern. This would challenge my creativity, help me master the art of quilty math, and would be a pretty legit thing to have on my "resume". So without further ado, here's "Independence Day." 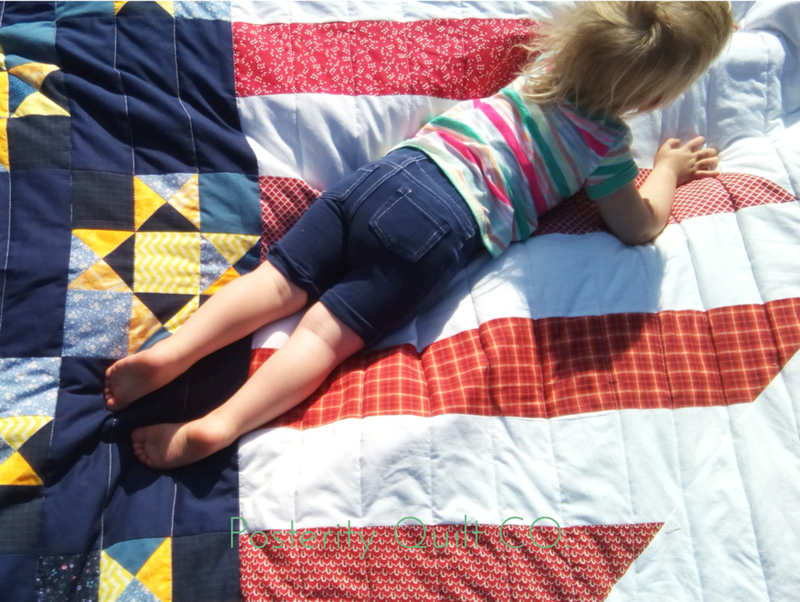 I've always really admired flag quilts. The variety and colors are beautiful, and the scrappy fabrics and long tradition of flag quilts gives you a feeling of historical continuity. Looking at those quilts gives me a sense of national pride and connection that all of their creators must share. Binge watching Netflix documentaries on the Civil War and the World Wars helps too. I wanted something quick and easy, so "Independence Day" is an over sized, modern take on the American flag. The lines of top stitching are 3" apart. 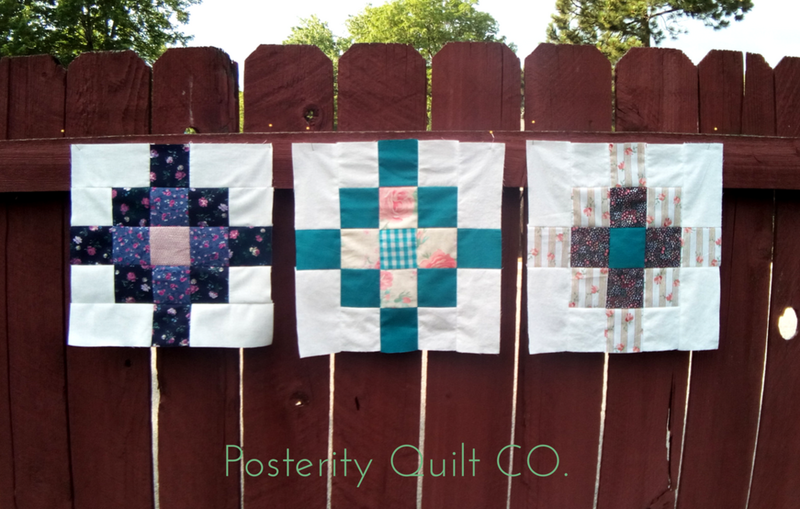 I didn't want the quilting to distract from the pattern, and sometimes I find that are quilted with a tight pattern are stiff and not as comfy-snuggly as I like a quilt to be. 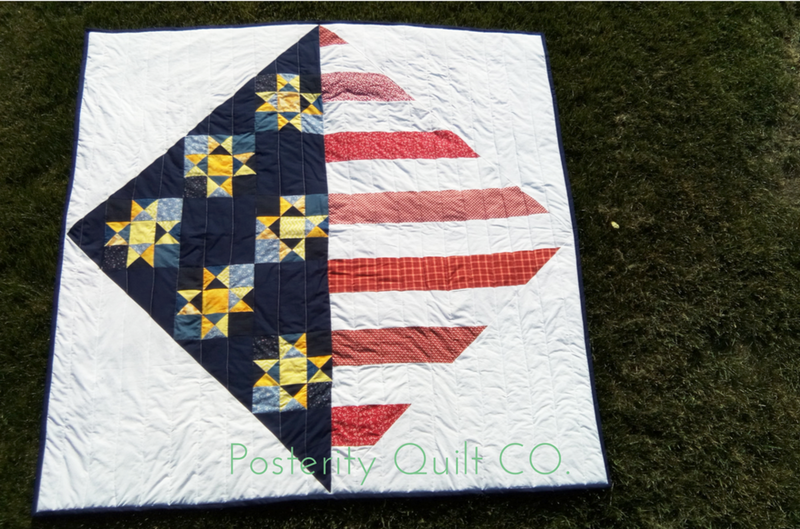 I thought a snuggly patriotic quilt was appropriate, it should feel like a hug from friends, family, summer nights, bare feet, fireflies, and clean sheets. It should feel like home. I think this beauty will make a nice addition to our fireworks viewing this year too! I will say that I have a new found appreciation for pattern writing. In the future I'll plan better instead of just diving right in with piecing and making it up as I go. That's how I usually quilt, but I learned a lot about the importance of organization. Thank you Robert Kaufman Fabrics for your Quilter's Friend QuiltCalc, you saved me from several headaches! I also have a new found respect for those bloggers who regularly create pdf downloads, they are way more involved in creating them than I had anticipated. I'm sorry to all of those blogger's whose downloads I abused and underappreciated in the past. M helped me take pictures and decided she was tired after about 3 pictures. I had to take the rest while she took a nap that afternoon! Do you like what you see? Let me know in the comments bellow!